2012, rising up chasing freedom. 2017, chased us out of freedom (the man is holding a flag of Jaysh al-Islam) Before the uprising Syria’s media were in the hands of the regime and dominated by the business figures linked to it. At the beginning of the uprising, there was a surge of new media actors linked to the protest movements and the democratic space they opened up. The uprising allowed for a general process of politicization among the large sectors of society involved in the revolutionary process, reflected in the creation of new newspapers, websites, blogs, groups in social networks, and so forth. Even now some of them still exist, despite the ongoing attacks and repressive actions on what is left of the protest movement, especially by the forces of Assad’s regime and their allies. The democratic protest movements have also suffered from the authoritarian practices of various Islamic fundamentalist forces. Syria had three government-controlled national newspapers, state radio and state TV, all committed to strengthening the legitimacy of the Assad regime. Pan-Arabist newspapers al-Hayat and al-Sharq al-Awsat, as well as Lebanese, Jordanian and Gulf Arab titles, and a small number of private magazines, were available and allowed in the 2000s. The political parties of the Progressive National Front (PNF), supportive of the regime, were also authorized to publish their own weekly newspapers. However, the country was still far from having a pluralist and free press. This media landscape failed to offer a real public discourse as private media were controlled by personalities linked to the regime. In September 2001, the Syrian regime actually adopted a new Press Law (Decree No. 50/2001), which provided the government with sweeping controls over virtually everything printed in Syria: newspapers, magazines, other periodicals, books, pamphlets, posters, etc. Syria was 173rd of 178 countries in a 2010 ranking of press freedom around the world by Reporters Without Borders. The authorities did not hesitate to censor the content of newspapers they considered had crossed the line. For example, the first privately owned newspaper al-Dommari, owned by caricaturist Ali Ferzat, was authorized to resume publication by the regime after nearly 40 years in early 2001, appeared on June 17, 2001 with two blank pages when Prime Minister Muhammad Miro took personal offence at an article deemed critical of the government’s performance. He also censored another article written about an imminent cabinet reshuffle. In the short window of opportunity between 2000 and 2001 referred to as the “Damascus Spring”, an opposition critic such as Michel Kilo was allowed to publish articles critical of the regime in the local state-controlled press, particularly al-Thawra, until that again ended in repression by the regime. Repression against bloggers critical of the regime was the rule throughout the 2000s and on the eve of the uprising. Kamal Cheikho, a Kurdish militant and blogger was arrested for example in June 2010. In mid-February 2011, the State Security Court sentenced the blogger Tal al-Mallouhi, arrested in December 2009, to five years’ imprisonment. She was accused of spying for a foreign country, but the reason for her severe reprimand stemmed from her blogging and online activities. She actually wrote poems and essays that focused on the suffering of the Palestinians, and she discussed the restrictions on freedom of expression. She actually wrote poems and essays that focused on the suffering of the Palestinians, and she discussed the restrictions on freedom of expression. In middle and late February 2011, it was Ahmad Hadifa’s turn. Known as Ahmad Aboul-Kheir, he was arrested for a few days when his blog offered guidelines for circumventing the censorship of sites blocked by the authorities. This was at a time when articles on the revolutions that had erupted in Tunisia and Egypt raised the possibility of contagion to other countries in the region. There were however some groups present on the web, but also on the ground, trying to promote democratic and progressive political thought. The Al-Thara Group was for example the first website to raise the banner for women’s and children’s rights. Between 2005 and 2011, the al-Thara Group trained more than sixty journalists in the arts of maintaining a free media, while it was also partner to a number of other organizations, participating in joint campaigns such as that against honor killing, or involved in the drafting of the parallel report for the Beijing World Conference on Women in 2010. People working on these websites frequently participated in feminist civil society activity, such as lectures, parades, workshops, and conferences. They played an important role in creating new perspectives, through the social exchanges that took place on their websites, for advancing women’s rights in Syria. The regime was afraid of activists and individuals engaging in dialogue on political issues, especially those with democratic and progressive orientation who gathered Syrians from various religious and ethnic backgrounds. For example in June 2007 when seven students from various religious backgrounds, including two Alawis, were sentenced to prison terms for online conversation about political reform, the arresting officer explained that, “these youths are more dangerous than al-Qa’ida, because they come from all sects”. This strategy of repression would be the same during the uprising: it was the democratic and progressive sectors of the popular movement who were targeted first. Similarly, the so-called new ‘private’ media scene which appeared, following Bashar al-Assad’s arrival to power in 2000, was far from creating a space for open and democratic debate. Syria’s most influential media tycoons were a collection of wealthy businessmen with close connections to the regime’s political, military and business establishment. They included Rami Makhlouf, Majd Bahjat Sulayman, Bilal Turkmani (son of Defense Minister Hassan Turkmani), Mohamed Saber Hamsho, Aktham Ali Duba, and steel tycoon Ayman Jaber. Rami Makhlouf established the popular Al-Watan newspaper. Majd Bahjat Sulayman, owner of Syria’s largest media empire, was the executive director of Alwaseet Group, and chairman of the United Group for Publishing, Advertising and Marketing (UG). Ayman Jaber and Mohamed Saber Hamsho, alongside a number of other Syrian businessmen, established Dunia TV and Sama satellite channel. Aktham Ali Douba, the son of the former head of Syrian intelligence, formed the al-Riyadiya newspaper and magazine with a clear monopoly on sports advertising. These same crony capitalists first tried their hand at funding the regime’s orchestrated mass rallies and public relations campaigns, while the private media owned by these businessmen linked to the regime from the first days of the uprising in an attempt to undermine the message of the protesters by defaming the protest movement and promoting the regime’s propaganda. The beginning of the uprising and especially its first two years featured a wave of civilian resistance using various means, including the media. In this period, people witnessed a surge of free newspapers throughout the country, but especially in areas liberated from the regime’s forces. The phenomenon of citizen journalists expanded considerably and news became a basic act of resistance carried out by Syrians in their revolt against the Assad regime. Over time, video activism was evolving into a homegrown journalistic scene with tiny local papers and online radio stations broadcasting openly in the liberated areas and underground in those under Assad’s control. By the end of 2011, Syrian Media Action Revolution Team (SMART), which was originally a support network for journalists activists and then became a news agency, was distributing equipment (satellite modems to connect to the Internet, telephones) and taught writing and production via Skype. The organization trained nearly 400 activists in journalism. 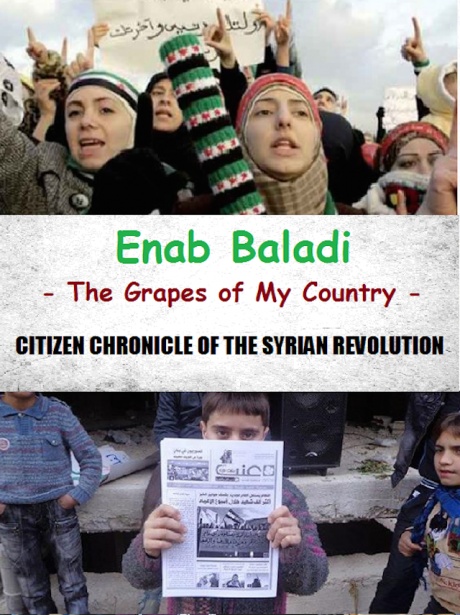 Villages and cities experiencing revolts established a number of smaller local newspapers, such as Oxigen run in the city of Zabadani; while some were able to reach wider audiences across the country, including Enab Baladi (Local Grapes) a paper from Daraya and Damascus established at the end of 2011 by a group of 30 intellectuals and activists, including 14 women; or Souriatna (Our Syria) managed from Istanbul, etc… (Dahnoun 2012; Foreign staff in Zabadani 2012, Culebras 2015a). Similarly, numerous local radio stations were established by activists within and outside the country. For example, Radio Fresh was set up by the activist Raed Fares in Kafranbel in the Idlib countryside, running it as a media center and a magazine published four times a year. “Sawt Raya” based in Istanbul, was founded by Alisar Hasan, along with a group of Syrian journalists broadcasting news and other programs, or ANA Radio established in early 2012 with the aim of increasing citizen journalism within Syria by ANA New Media Association – the network behind the station. The famous journalist Zaina Erhaim for example, worked within Syria for long periods and joined the Institute for War and Peace Reporting (IWPR) helping to establish a series of blogs that covered the history of the uprising and war through the eyes of Syrian women, by allowing regular citizens to write stories of their own experiences. She also trained hundreds of citizen reporters from inside Syria, approximately a third of them women, in print and TV journalism. She then was behind the initiative for a series of short films, “Syria’s Rebellious Women,” telling the stories of women who had stepped into positions of leadership and responsibility. She also trained hundreds of citizen reporters from inside Syria, approximately a third of them women, in print and TV journalism. According to the Syrian Media Action Revolution Team (SMART), in September 2014 there were about 500 print journals and about 20 radio stations, while it was estimated that as many as 298 newspapers being circulated in different parts of the country during various periods of the uprising. Similarly, some autonomous actors in the Kurdish political and social scenes from the PYD, such as Radio Arta, were still trying to make their voices heard despite being targeted at least twice by PYD armed forces in 2014 and 2016. A vibrant independent media scene was trying to develop in PYD-controlled areas, regardless of the tough competition that came from better resourced and more numerous PYD party-affiliated media outlets (such as Ronahi TV, Orkes FM, and Hawar News Agency, among others). Democratic journalists and citizen media actors were all the target of the regime because of their role in informing the world of the crimes and exactions of the security services. Between mid-March 2011 and the end of April 2014, the Violation Document Center, a network of Syrian opposition activists documenting human rights violations perpetrated since the beginning of the uprising, documented the death of 307 journalists thanks to the firepower of the regime’s forces and militias. Syria became almost the world’s deadliest country for journalists, according to the 2017 World Press Freedom Index by Reporters Without Borders, in which it is ranked 177th out of 180 countries. “The President Assad treats the people as if he is Sunni, and he is educated and young and he might be able to do a lot, but his problem is that he is a prisoner of his entourage and religious sect”. Syrian protesters at the beginning of the uprising held banners opposing sectarian discourse like the slogan, the ‘Sunni blood is one’, promoted by some Gulf channels, while chanting instead in favour of the unity of the Syrian people. In May 2013, the same Sheikh Youssef al-Qaradawi declared a jihad on the Syrian regime at a rally in Qatar, calling for Sunni Muslims to join the fight against president Bashar al-Assad and his Shi’a support base, in addition to calling the Alawi sect “more infidel than Christians and Jews”. He added “How could 100 million Shi’a [worldwide] defeat 1.7 billion [Sunnis]?". Similarly, the Râbitat al’âlam al-îslâmi (Muslim World League), an association of Islamic clerics established in 1962 and serving as a political instrument of Saudi Arabia’s foreign policy, repeatedly characterized the Syrian regime as a “rogue Nusayri regime” …“stressing the obligation of supporting the Muslims of Syria and saving them from sectarian conspiracy”, in other words from the Shi’a. Gulf television channels also fuelled sectarian tensions from the beginning of the uprising. Faisal al-Qassim, a presenter on Jazeera Channel, hosted a segment on whether Syria’s Alawite population deserved genocide, while al-Arabiya welcomed Syrian Salafist cleric Adnan al-Arour, who once promised to “chop you (Alawites) up and feed you to the dogs”. Similarly, Islamic fundamentalists movements in Syria had their own media and propaganda tools, which promoted their own reactionary and sectarian discourses. They also did not hesitate to repress and detain independent citizen journalists critical of their actions and policies in areas under their control, while banning magazines from opposition groups. In August 2017 for example, “Rising for Freedom” magazine was outlawed in Douma, and two of its journalists sent to jail over an article published earlier this year by a court controlled by the salafist organisation Jaysh al-Islam. The offices of the magazine and NGOs including the Violations Documentation Centre (VDC) were shut down in March 2017, and VDC was closed again in mid August by Jaysh al-Islam after being attacked by a mob of its supporters. As a reminder, Jaysh al-Islam is the ruling authority in the Eastern Ghouta and had embroiled “Rising for Freedom” staff in a succession of disputes from its founding moment. Unfortunately some Syrian opposition media also promoted a sectarian discourse on occasion. For example Orient TV owned by exiled Syrian businessman Ghassan Abboud, known for his sectarian diatribes, actually presented the massacre in May 2015 of more than 40 civilians, including children, by IS fighters in the mixed town of Majaoubé, composed of Sunni, Isma'ili and Alawi, as members of the regime’s forces. This presentation of the events provoked a significant controversy as this was considered a justification for a sectarian crime. As mentioned above, the uprising created an upsurge in the independent media run by popular activists. But a fresh dynamic was also created among what were called “pro-regime constituencies”. Alongside official state media instruments and the Syrian Electronic Army directly controlled by the regime, pro-regime media outlets and Facebook pages multiplied significantly and had some impact on the traditional media landscape of the regime. These new media outlets usually resorted to the Internet, and in particular to social media such as Facebook, to publish content. This avoided the necessity of acquiring an operating license and the long bureaucratic procedures that were still implemented in regime-held areas. These pro-regime Facebook pages, often based on a network of people from a particular village, neighbourhood or city and operating autonomously from the regime’s control and its associate elites, generally reinforced the regime’s narrative, becoming, for example, key sources of information on military movements and local incidents often not covered in state media. Researcher Antun Issa has explained, “They represent the ‘mood’ of the communities that support the government, and thus can be viewed as a barometer of support for the regime”. But this was also the case when these pages or media outlets raised criticisms against some sectors of the regime, and condemned some of its behaviour. A Facebook post on the pro-regime “Syria Corruption in the Age of Reform” page for example was highly critical of state-run media, labelling them as “traitors” for refuting the opposition armed forces’ military gains in Aleppo in August 2016. A few months later, regime supporters used social media to expose the looting by pro-regime militias of some neighbourhoods of Aleppo. Another example was a report in Baladna News from April 2016 that, though massively supportive of the government’s parliamentary elections that same month, included two significant criticisms: 1) that many people could not vote as a result of security risks, and 2) there was some dissatisfaction with the candidates, taking into account the fact that recent parliaments had done little for the needs of the citizens, and finding it hard to see how this one would be any different. Other reports foregrounded the problems of corruption in various sectors including wheat prices and telecommunications. In February of 2017, new salvos of criticism were hurled against the government following a country-wide fuel crisis, especially in the coastal Lattakia province where most gas stations ground to a halt for lack of fuel. Many minibus drivers announced an open strike until a solution was found, while officials continued to have access to fuel for their own vehicles. Most of the civilian population was denied access to fuel because militiamen, security and army personnel monopolized the limited fuel available. The loyalist social media pages blasted the Khamis government and oil ministry for their repeated hollow promises when it came to securing fuel for the citizens. Media freedom in regime-held regions remained more restricted than in opposition-controlled areas, except those of the IS. This did not prevent the new methods of media coverage, which appeared and expanded during the uprising, from laying the foundations for a shift in Syria’s media culture in a post-war context. The regime forces crush and will have no problem in repressing all forms of opposition independent media in the near future. But it would be difficult to envisage the regime targeting those of its own supporters who had established a strong online media presence, and been instrumental in promoting the regime’s narrative and propaganda to Syrians within the country. This has ensured that, even within the regime’s sphere of control, a more open media culture might survive and some form of growing tolerance of criticism against the regime may continue to emerge. Uprisings in Tunisia, Egypt, and elsewhere inspired the Syrians to take to the streets in mid March 2011 with similar demands for freedom and dignity. The growth of the protest movement allowed for a democratic media scene to expand, reflecting the new energies on the ground. Unfortunately, just as it was a reflection of the strength of the protest movement, its repression led to a considerably diminished democratic media scene, one that today is largely mostly outside the country, although some pockets still exist within. However there is still hope. The Syrian revolutionary process is a more thoroughly documented uprising than has ever been seen before in history, notably thanks to these democratic media. There has been a wealth of recording, of testimonies and documentation of the protest movement, the actors involved and their modes of actions. In the seventies and eighties, Syria witnessed strong popular and democratic resistance with significant strikes and demonstrations throughout the country with mass followings, unfortunately this memory was not salvaged and was not well-known to the new generation of protesters rising in the country in 2011. The memories of the Syrian uprising that erupted in March 2011 however will remain. This memory will serve not only to look at the past, but to seize this past to build on future resistance. The political experiences that have been accumulated since the beginning of the uprising will not disappear. Iqtissad (2015), “Interview: Mohamad Mansour – How Syria's Media Tycoons, Control the Market”, (online). In June 2016 Enab Baladi consisted of a weekly printed newspaper of 7000 copies and a website, which is visited by 250,000 people every month. The IWPR is an organisation that supports reporters in countries in conflict, assisting them to focus on human rights and justice issues. Carlstrom, Gregg (2017), “What's the Problem With Al Jazeera?”, The Atlantic, (online).